Haarii, or dragon boat races are an ancient Okinawan seafaring custom celebrated as a festival to thank the ocean for the blessings it provides. For these races sabani’s, which are elongated boats used by Okinawan fishermen for centuries, are used. Fishermen oftentimes traveled great distances from Japan to the Indian Ocean in sabani’s in rough sea conditions. A number of races are held each year in these boats, with the Itoman and Naha Haarii festivals being the biggest events, both which we will cover here. 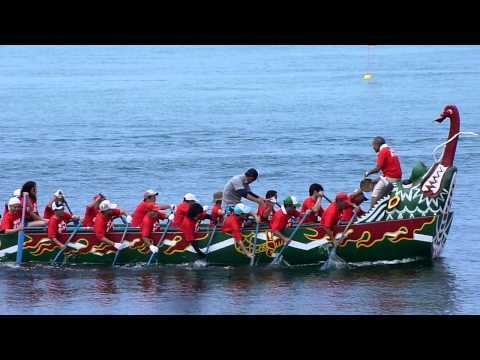 This video of the Okinawan dragon boat races is owned and created by Jaymes Grossman. Haarii festivals took place to pray for a good catch as well as for the safety of fishermen who traveled great distances in sabani’s in very rough sea conditions. Events such as these have only recently been revived. Numerous dragon boat races take place each year in Okinawa but here we will only cover the Itoman and Naha Haarii. The Naha Haarii is the first dragon boat race event of the year and is timed to take place during the Japanese Golden Week holidays (April 29 – May 5). It’s a three-day event where races only take place on the first and third day. The second day will give visitors the opportunity to go on sabani rides. The third and final day is where the ritual prayer and the main 600m haarii races take place. Throughout the Naha Haarii festival the 200,000 visitors will also be entertained by evening firework displays and various musical and traditional performances, and even Sumo wrestling. 3d to the 5th of March. Each year many thousands of people flock to the port city of Itoman in southern Okinawa for the 500 year old Itoman Haarii. Races are divided up into categories, for example, school students vs teachers and other rival teams consisting of Okinawans and US military personel. A unique aspect to the Itoman Haarii which sets it apart from the other dragon boat races is something called ‘Kunnukase’. It’s a halfway point event where each crew turns their sabani upside down in the water, only to turn it back up, scoop the water out and then continue the last half of the race. There is also an additional competition where competitors have to catch a duck with their bare hands while swimming. Usually on the 4th of March. Dragon boat racing in Okinawa dates as far back as the 14th century when the region was still independent from Japan and known as the Ryukyu Kingdom. The exact origins are not exactly clear but what is known is that it came from Chinese influence. One theory suggests that a Ryukyun prince was studying in Nanjing, China when he saw the local Chinese doing these races. Upon returning home the prince made his own Sabani and soon afterwards local Okinawan fishermen made theirs too to be used for fishing and later for racing competitions. These races were banned when Japan made the Ryukyun Kingdom one of their prefectures. It was temporarily revived until 1928 when it once again became abolished. Dragon boat races wouldn’t became a permanent yearly event until 1975. Learn more about the Naha and Itoman Haarii from the official Okinawa travel and tourism website here.